If you missed the March on March 24, Saturday, google the above: Jennifer Hudson transforms the Dylan protest ballad, “The Times they are a changin,’” into a gospel celebration of soulful hope, a song sung from the very heart of the “movement.” Listen to 11-year old Naomi Wadler, the slim bright-eyed black girl, on the right, who reminded one of Barack and Michelle. And, in the middle, the heart and soul of Parkland, Florida, Emma Gonzales, whose impromptu remarks on Feb. 17, “We call BS” lit up the television screens and social media platforms. On Saturday Emma upped the ante and used the rhetoric of silence to focus media and crowd attention on the time it took for 17 of her classmates to die, six minutes and twenty seconds. While she framed the speech with an intro and outro, she spoke for just two minutes. You could hear her breathe, feel her tears, see and hear the crowd and the media commentators grow nervous as the seconds turned into minutes, as silence called attention to the immortal spirits of the dead. In D.C. one thinks also of others…Abraham Lincoln and “Gettysburg,” Martin Luther King and “I have a Dream,” The 1967 March on the Pentagon (Mailer’s Armies of the Night) and Maya Lin’s monumental wall to the fallen soldiers of Vietnam. Oh, yes, Hudson, Wadler , Gonzales, and a cast of all-stars from Chicago to LA to Parkland appeared in the company of immortals on Saturday. March 24 and will live on in the memories. I was reminded of moral awakenings, of the Civil War and Civil Rights, of voting rights for Black Americans, Women, and Native Americans, of the perverse claims of politicians who have substituted the divine right of the gun for the symbol of the crucifix, or how “right to lifers” call for the “death penalty” and forego “charity,” neglecting to pass budgets for the nurture of the living. But now comes a moment and a march wherein the leaders of us all from Parkland, the teen brigade, speaking with experience and the voice of authority to reason and faith, remind us that sacred human life is both a moral good and an ethical responsibility. The Teens come to awaken the slumbering masses similarly to the way Socrates stung the soul of Athens and Jesus opened the eyes of those who had lost their way in Palestine. During this Holy Week, the March has reminded us how “natural goodness” forms the moral core of disparate cultures, philosophies, and religions. The rule of law flails aimlessly without a foundation in moral and ethical traditions. Once Americans called themselves “Christians,” a religion best known for its expression of love, mercy, and compassion. Today the loudest voices of the so-called Evangelicals proclaim their faith but are MIA. 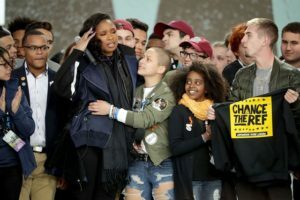 The media, politicians, and lobbyists like the Koch Brothers and the NRA speak in codified “talking points.” But the truth is carried in the hearts and mouths of the Parkland students.